The tunes of jazz music was heard at the Grand Pacific Hall in Yogyakarta on Saturday evening (3/11). The 24th UGM Jazz concert was organised by Faculty of Economics and Business UGM. It was first organised in 1987 by the name of Economic Jazz Live. But since 2000, it became UGM Jazz. The event this year has invited leading musicians from the country and abroad such as Bob James, Ruth Sahanaya, Kunto Aji, and Candra Darusman. Ruth Sahanaya and Candra Darusman were not strange faces in the UGM Jazz, because both have featured in previous concerts, even in the first concert. Their performance this time brought a moment of nostalgia for the audience from the older generation. Melda from Yogyakarta said she came every year to the concert. “Seeing Ruth Sahanaya has brought my memory back to the times when I was studying here,” she said. For Kunto Aji, this was his first presence at the UGM Jazz. 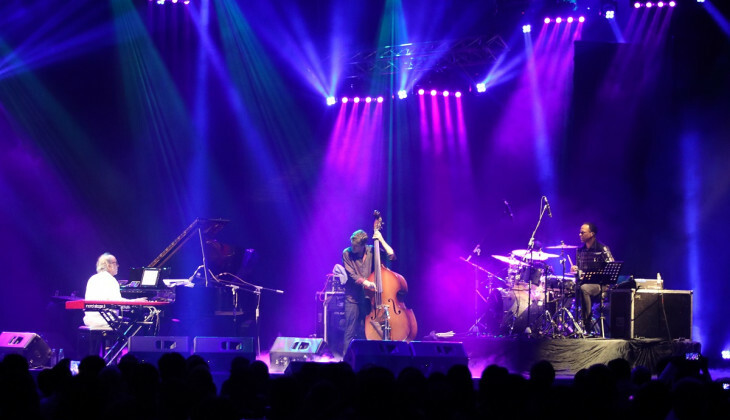 The promoter, A. Tony Prasetiantono, M.Sc., Ph.D., said Kunto Aji had been purposely invited to bring the millennial audience closer to jazz music. This resulted in the audience singing together to the songs. The guest star of the concert, Bob James, proved his world class presence by presenting an amazing performance. With his bassist and drummer, Bob entertained the audience through the piano. Tony said the attendance of Bob James in the concert was truly an honour. “Obviously, he has won 2 Grammy Awards and 11 times being nominated in the same event,” he said. This concert, according to Tony, was very satisfactory. The tickets were sold out and the audience seemed very entertained. “Now I’m more confident to be able to organise next year’s concert,” he said.